Support bar fits across the front of the Ocean shower chairs. Metal bar with foam grip surface, attaches to shower chair arms with rubber straps. Unsnap a strap to allow the bar to be easily moved to one side for transfers. 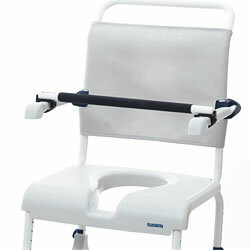 Designed to fit shower commode chairs: Ocean, Ocean VIP. This Safety Bar does NOT fit The Ocean XL model.